The population of Sub-Saharan Africa, over a billion in 2018, is projected to more than double to 2.2 billion by 2050, largely because the average woman in Sub-Saharan Africa has five children. About two percent of Sub-Saharan Africans have left their country of birth for a year or more. Until the 1990s, most African migration involved movements from one African country to another, as from poorer Burkina Faso and Mali to richer Ivory Coast, or from poorer Lesotho and Zimbabwe to South Africa. However, since 2000 more Sub-Saharan Africans are leaving for European countries, fueling a smuggling business that moves Sub-Saharan Africans via Libya and Morocco to Italy and Spain. The working age population of Sub-Saharan Africa is projected to continue increasing, promising more emigration pressures. Well-educated migrants have the most opportunities to find jobs in richer countries, but they may also be the people needed to spark development at home. The figures below make three points. First, the share of Sub-Saharan Africans who were international migrants fell between 1960 and 1990, from about 2.5 percent to two percent of SSA residents, but the share of migrants has risen since 1990 to almost 2.5 percent again. All of this increase in emigration involvements movements outside Sub-Saharan Africa. 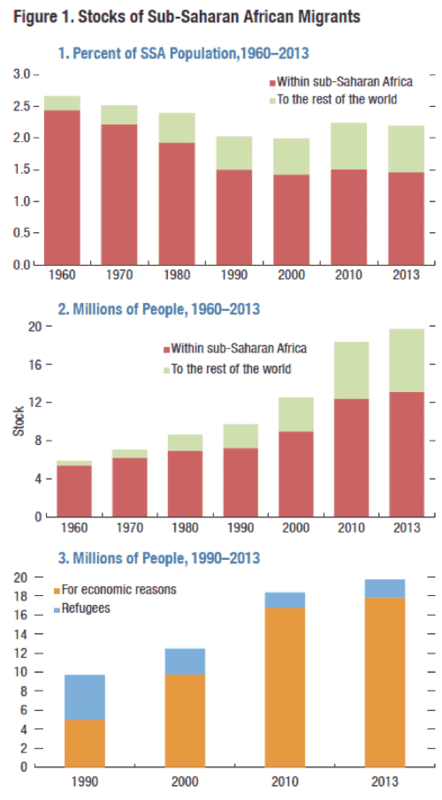 Second, the population of Sub-Saharan Africa is growing rapidly, from less than 500 million in 1990 to a billion today. A 2.5 percent migration rate means many more migrants; their number rose from 10 million in 1990 to 25 million today. Third, the share of Sub-Saharan African migrants who are refugees has been declining, from 50 percent in 1990 to 10 percent today. Population growth in Sub-Saharan Africa may portend a wave of migrants to Europe; there are projections that 25 percent of the 730 million Europeans in 2050 could be African immigrants or their descendants. Others emphasize that, while most North African migrants leave Africa, two-thirds of Sub-Saharan migrants remain in Africa, and they do not expect this pattern of most Africans who leave their country of birth remaining on the continent. The rising share of Sub-Saharan Africans who leave Africa, coupled with the rapidly rising number of Sub-Saharan Africans, suggests that European nations that now have one or two percent African-born residents could double or triple the African-born share of their populations by 2050. Many factors, from policies governing family unification to border enforcement to economic development in Sub-Saharan Africa, will determine whether the increase of Africans in Europe will be slow and gradual or quick and sharp. France, Sweden, and the UK are the European countries that currently have the highest shares of Sub-Saharan Africans among residents, about three percent.